A native of the Atlas mountains in northwestern Africa, the cedar has been traditionally used to calm emotions, relieve worries and enhance contemplation. We chose this incense to assist the guests in letting go and allowing themselves to sink into the warm refuge of Smoke & Vapour. 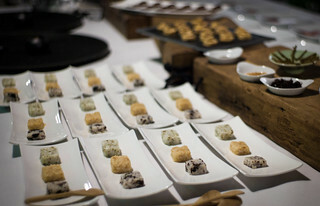 After the strong tastes of the dishes in Arrival and Descent, we needed a light palate cleanser to prepare the taste buds for the subtle flavours of the courses in this movement. 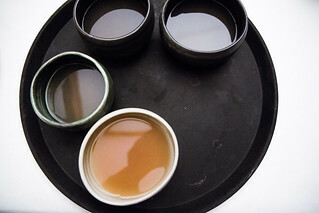 Herbal distillates, or what used to be called floral water, contain the essence of a plant's flavour and fragrance, soluble in water instead of oil. We chose sage and mint, both of which are known as physical and emotional purifiers, invigorated with a hint of lemon to keep the spirits up. Boil tap water. Cool and filter to remove impurities. Add the other ingredients. Serve a mouthful in a small lab pipette. Reminiscent of unknotting warmth in a fragrant steam bath, water evaporating off hot rocks cannot but invite a deep sense of relaxation. 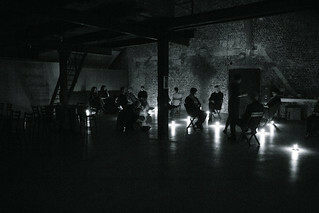 We made this part of the evening explicitly quite ritualistic, with men bringing the rocks and the women slowly pouring scented water, comforting the archetypal subconscious to let go of fear and unease. The water was mixed with two essential oils, a grounding, woody cedar and aromatic, invigorating rosemary. Heat the stones in the oven for about 1/2 hour at 200°C. Boil the water and add the essential oil (divide in 3 flasks: 1 cedar, 1 rosemary, 1 cedar and rosemary, 5–7 drops per flask) just before serving. 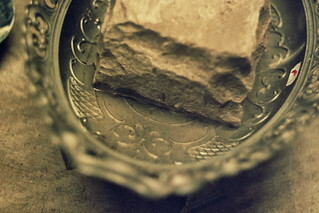 Place the stones in the space, pour boiling scented water over them 2–3 times. 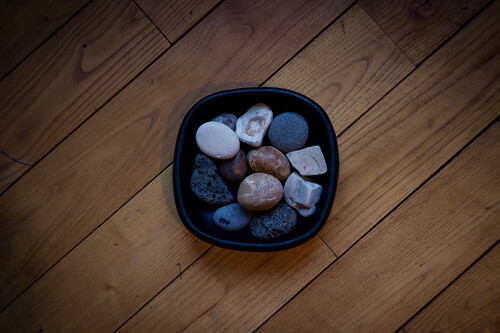 Warm pebbles can relax sinews and stimulate circulation in cold hands, providing a snug sensation of visceral reassurance. The stones we chose were collected by Maja Kuzmanovic on her travels to the seas and mountains of Europe, Asia, Australia and New Zealand, ranging from the smooth while limestone of the Adriatic to the black volcanic rock of the Himalayas. Heat small round stones (from different parts of the world) for ~5 minutes in the oven with the cobblestones. Try them out for temperature before serving. Give one to each guest to warm their hands. Steam rice for about 15 minutes at 100°C. Leave to cool until lukewarm. 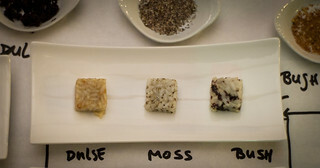 Divide rice into 4 parts. Mix one part with dulse flakes, another part with Icelandic moss, arctic salt and truffle oil, the third part with bush tomato and fleur de sel (place pickled samphire on top). Mix the fourth part with a few drops of thyme oil (watch out it's very intense!) and add wasabi to taste. Make small cubes of each mixture. Serve in a row with raw samphire brushed with lemon juice. Japanese green tea owes its colour and fresh taste to the steaming of the leaves to prevent their oxidisation. We chose to serve the shade-grown Gyokuro (Jade dew), as its pale colour and subtle taste complemented the atmosphere in the room. 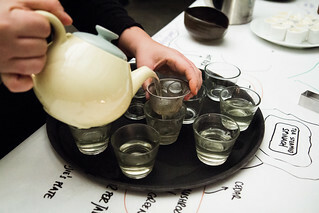 Gyokuro: Infuse the tea for 2–3 minutes. Matcha: Mix about 1 teaspoon for 3 dl of water. Froth it up with a tea whisk. One of the favourites of the evening, a warm, comforting translucent broth, where the heartiness of smoked shellfish meets the sweetness and acidity of the beer. 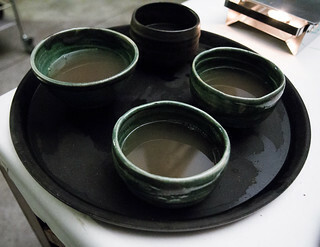 We served the soup in Kosi Hidama's bowls, fresh out of the kiln just hours before the dinner. Place all ingredients except tomatoes into a metal dish and pour La Chouffe over them. Place in a home smoker and smoke for 25 minutes. Transfer to a large pot, add tomatoes, and cook for about 1 hour without stirring too much. Let the soup cool down then strain. Put in the freezer overnight or until frozen solid. Line a sieve with cheesecloth, then place the frozen soup into the sieve. Let it slowly strain through the cheesecloth as it defrosts. Warm before serving and add salt and pepper to taste.